Smarter Balanced Assessments acknowledge that individuals may access and express information differently. 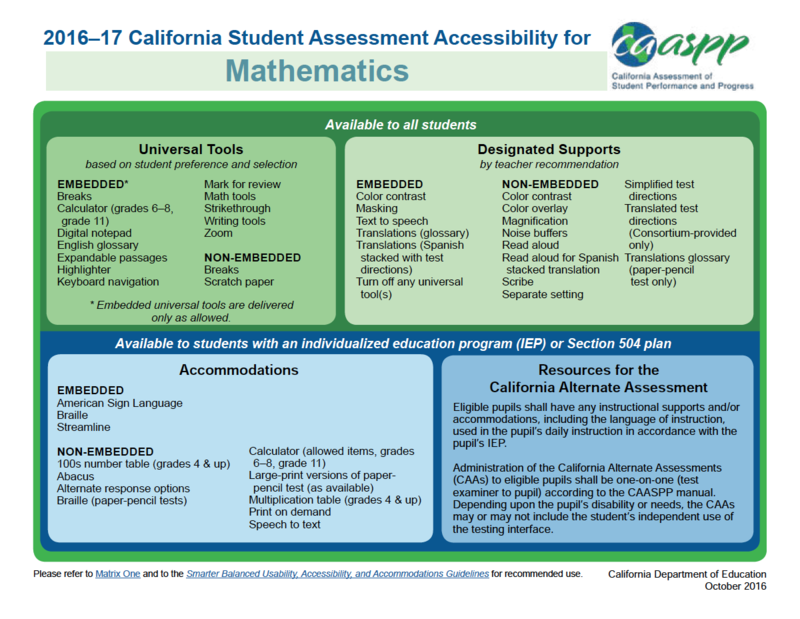 This page offers information and resources to support educators in their work thinking about universal tools, designated supports, and accommodations as part of the California Assessment of Student Performance and Progress (CAASPP). This blog post explains actions to help students learn about and apply SBAC accessibility tools throughout the school year. Read "Linking SBAC Accessibility Tools to Daily Learning." A new CAASPP video resource for 2017-18 is provided here with examples of selected accommodations. In addition, the Centinela Valley Union High School District has created a number of YouTube videos demonstrating selected CAASPP/SBAC tools here. The following references provide helpful information about English, Math, and Science supports respectively. Click on each image below to expand. Universal Tools are available for all pupils. Pupils may turn the support(s) on/off when embedded as part of the technology platform for the computer-administered CAASPP tests. All pupils shall be permitted the following designated supports on the CAASPP tests, when determined for use by an educator or group of educators or specified in a pupil’s IEP or Section 504 Plan. 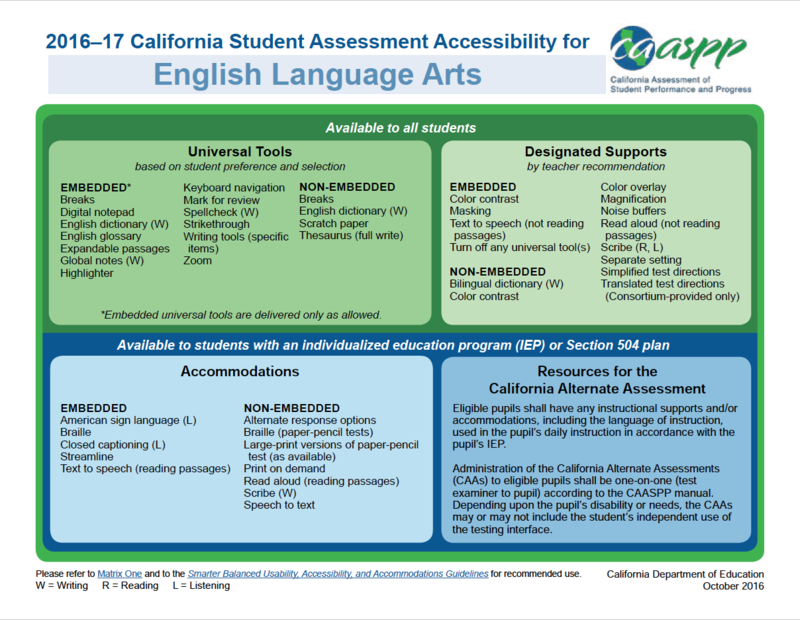 An English learner shall be permitted the following designated supports on the CAASPP tests when determined for use by an educator or group of educators, who may seek input from a parent(s) or guardian(s). 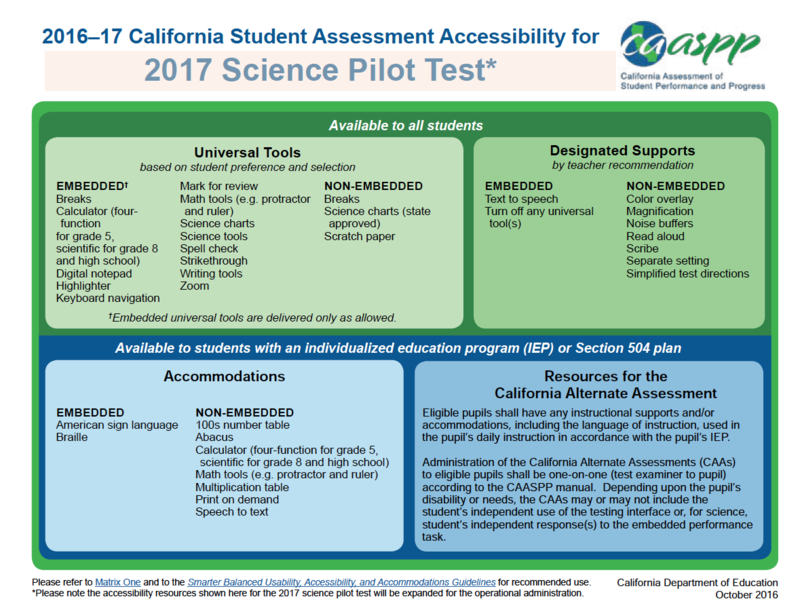 For the CAASPP System, eligible pupils shall be permitted to take the tests with accommodations if specified in the pupil’s individualized education program (IEP) or Section 504 plan. The 2017-18 ISAAP Tool (xlms) is an optional resource designed to help school teams plan and activate designated supports and accommodations with the SBAC. It will produce online student settings files that can be uploaded directly into TOMS. Go to the CAASPP Accessibility and Accommodations Support page to learn specific details on using this resource. The seven-step process offered below is one method schools can use in conjunction with the ISAAP Tool for planning accessibility supports. Select key staff members who will be involved and define their roles. Provide information and training to staff, information to parents, and information and training to students as appropriate. Identify students who may benefit from designated supports. Select the appropriate supports and accommodations for each student. Enter designated supports and accommodations into TOMS. Perform a pre-administration check to verify they are correct. Check for delivery of the assigned designated supports and accommodations at the time of the test.